Achieving perfect poached eggs should be simple but for many of us it can prove a challenge to get them looking as good as they taste and also tasting as good as they look. Everyone seems to have an opinion as to exactly what you should or shouldn’t do and it has been a recent topic of conversation on our foodlovers forums. While creating cafe style “snowball” eggs takes some practice there are a few key things to having eggs wrapped in their whites and looking pretty good. Choosing your eggs. For perfect poached eggs your eggs must be at room temperature and as fresh as can be. This helps the egg white to stay intact and and not disperse all through the water (I am sure many of us have had that happen before). Poached eggs cook best in near boiling water, some use a frying pan whereas I find that a large saucepan with water depth of at least 10cm works best. Bring the water to the boil and then reduce the temperature until the water is at a rapid simmer as opposed to a rolling boil. Too low a temperature and too hot are equally detrimental. There should be gentle small bubbles but not a rapid boil. Adding a splash of vinegar or lemon juice to the pan is popular as the acid helps the whites to set quickly and not disperse. Lighter style vinegar such as white wine vinegar is best, malt is too strongly flavoured. However, not everyone agrees with this and there are some that say the whites become too firm and poaching in pure water makes for softer egg white. Never add salt to the water. Breaking the eggs into small cups first is recommended – espresso cups are ideal. This means the whole egg is quick to reach the water and will help the white to stay with the yolk. Hold the cups close to the water and drop the eggs in quickly in one movement, sending them on a high dive into the water will almost definitely scatter the white into the pan. Creating a whirlpool in the water first will also help the egg whites to fold over the yolks. Make sure you stop stirring before the eggs are slipped in and add them quickly. Allow the eggs to cook in the water for 2 1/2 minutes – assuming you like soft yolks that is. Some turn the heat off and place a lid over the pan but I find that 2 minutes of simmering is ideal. Lift the eggs from the water with a slotted spoon and sit to rest on a folded paper towel or tea towel to drain off any excess water before transferring to your toast. Do you have any tried and true methods for poaching the perfect egg? 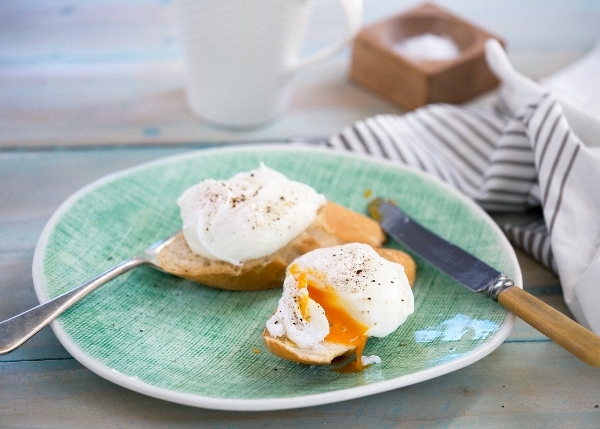 Farmer Brown is giving poached egg lovers the chance to crack the perfect poached egg! Simply ‘Crack, Dunk, Drain, Slide’ with Wiltshire Poachies to create poached egg perfection! From end of September two free Wiltshire Poachies will be available in supermarkets in the Farmer Brown Colony laid 10 and 20 packs. 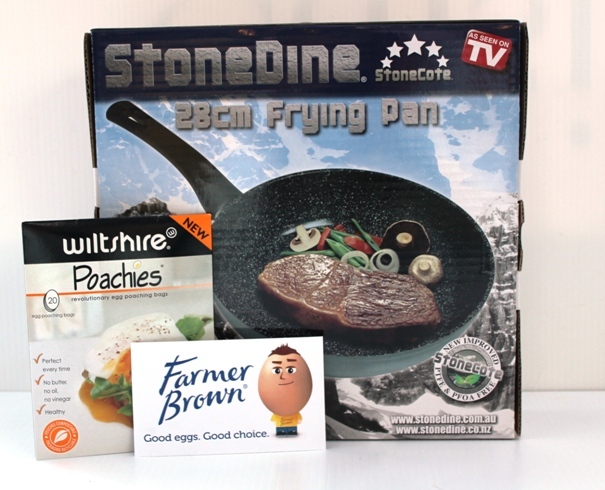 To celebrate the arrival of Farmer Brown Wiltshire Poachies in-pack promotion we’re giving away a complete pack of Wiltshire Poachies, a $50 Farmer Brown Colony laid voucher and a StoneDine pan – the culinary revolution that brings the unbeatable flavour of cooking on stone into your home. Fiona that sounds positively divine! Lucky you being in Paris.